The German-Australian Opera Grant welcomes back from Germany its past winner Angus Wood. 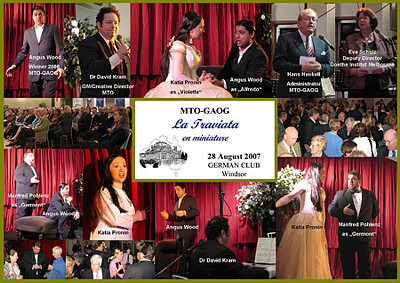 One of his major roles at the Hessisches Staatstheater Wiesbaden has been ‘Alfredo’ in ‘La Traviata’. Enjoy Angus Wood performing in this short version of the popular opera, together with Katia Pronin as ‘Violetta’ and Manfred Pohlenz as ‘Germont’, under musical direction of Dr David Kram. Winner of the 2006 GAOG and ensemble member of the Hessisches Staats-theater Wiesbaden. Young performer with diplomas in voice and piano from St Petersburg Conservatorium. Active Victorian performer, teacher and conductor of German descent. Head of Opera at Victorian College of the Arts, Creative Director MTO, former Conductor of many German opera houses. followed by an introduction of the artist and word of thanks. Enjoy HENKELL VINEYARDS Wines, a selection of fingerfood and the company of the young singers and friends.